This arrangement is based on a madrigal written for an a cappella choir. The piece is cheerful and plays with echo effects. In this arrangement the echoes are created using a canon between two four-part groups. 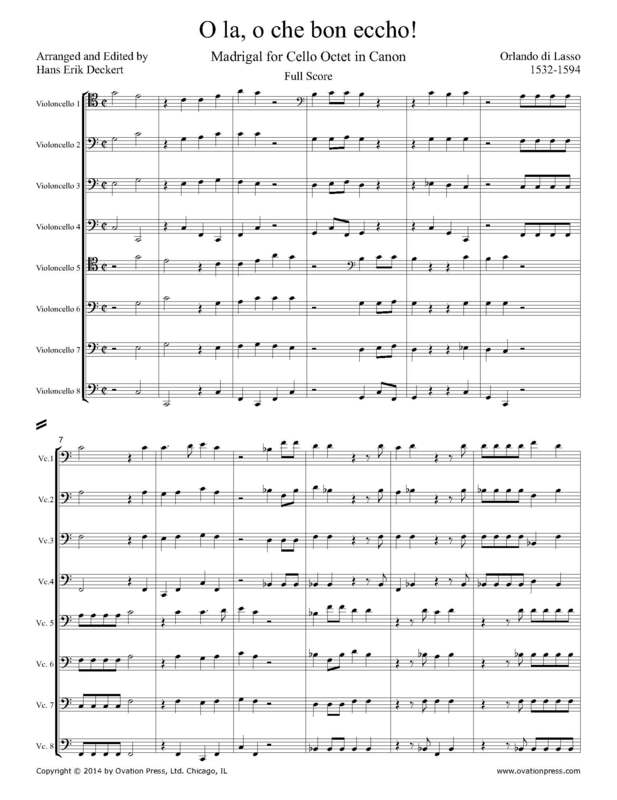 The melodies are played repeatedly with very short phrases in the first group, and are then promptly answered by the second group a half measure later. This creates a very natural echo effect between the two groups. It is recommended that the first group have at least 2 cellos on each voice, while the echo group consists of one cello on each voice. For maximum echo effect, the echo group should perform offstage or from a neighboring room. O la, o che bon echo! Pigliamo ci, piacere! Ha ha ha ha ha, ridiamo tutti! O bon compagno! Che voi tu? Voria che tu cantassi una canzona. Perchè? Perchè si? Perchè no? Perchè non voglio. Perchè non voi? Perchè non mi piace! Taci dico! Taci tu! O gran poltron! Signor, si! Orsu non più! Andiamo! Adio bon echo! Adio bon echo! Rest' in pace! Basta! Basta! Basta! Basta! O, what a good echo! Call it, try it if you please! Ha ha ha ha ha, let us all laugh! What a good companion! What do you want? I want you to sing us a song. Why? Why yes? Why no? Because I don’t want to. Why not? Because I don’t want to! Be quiet, I say! Be quiet yourself! You large imbecile! Yes, sir! That’s enough! Let’s go! Good bye, good echo! Good bye, good echo! Rest in peace! Enough! Enough! Enough! Enough!